You must be a member of the Milan Mediterranean Culture Group to attend this activity. Would you like to join this group? 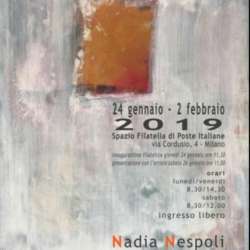 For our first group activity of Protected content have chosen a new exhibition by the Milanese painter Nadia Nespoli. Located in a beautiful historic building in the center of Milan, the exhibition is titled "Meditazione per occhi" (Meditations for eyes"), and comprises a series of paintings that stimulate visual reflection and calm. Artist and curator will be there to talk and introduce the artworks in an informal and pleasant way. The vernissage will be accompanied by a sparkling wine degustation offered by cantina Rebollini and delicacies made by pasticceria F.lli Grassi, Milan. What a perfect way to start your weekend! Mind that this event is open to the general public. You can bring along your international friends, for non internations friend invite them to subscribe to internations group. But please confirm your subscription since the number of places is limited.